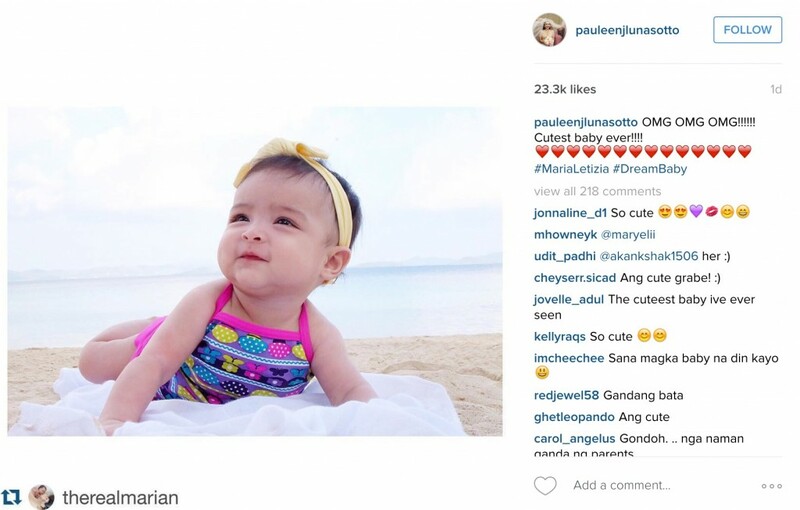 LOOK: Celebrities gush over Maria Letizia’s Beauty! Mommy Marian Rivera-Dantes posted a very charming photo of 4 month old daughter Maria Letizia while in vacation on her Instagram account, and celebrities can’t help but to gush over Baby Zia’s Beauty. Celebrities like Aiai Delas Alas and Pauleen Luna-sotto even reposted her photo on their Instagram account.. While Celebrities like Bianca Gonzales-Intal, Boobay and Valeen Montenegro commented on Marian’s post. “She looks like you!” Says Valeen. Dantes Family is currently on vacation on Palawan. Previous PostLOOK: The Encantadia 2016 New Teasers! Next PostDingdong Dantes talks about life with Marian & Baby Zia! Who does Baby Sixto resembles?